My name is Mohan and I hope this meets you well discovering newer and better ways to be successful in your daily futures trading. I have been trading the futures markets for about 33 years and trading live in front of a large group of traders for over 18 years in the industry. One of the key things in the futures industry if you are looking for advice is to find someone to learn from who is above all honest and truthful about their trading results. Also, you should have some proof of their credibility in terms of being able to see their live trading results either on a YouTube channel, in a live trading room type setting as well as proof of their experience in the trading industry. Whether you are a beginner in futures trading or have developed some experience through gains and losses this article will assist you in achieving consistency. As mentioned, I have been trading the futures markets for 33 years and I have gained a lot of experience on the long road of “the learning curve”. This means making a lot of trades…both winners and losers and gradually learning how to achieve consistency. The proof of this can be seen in the results I have achieved in my trading services such as my “Day Traders Action Live Trading Room” and the results of traders who own my top selling “Boomerang Day Trader”. My goal in this article is to try to assist you in speeding up your learning curve so that you can move quicker towards finding high probability trading setups with consistency. First, developing strategies that get you on the right side of the market is vital and #1. Then comes the REAL KEY to trading which is CONSISTENCY. You can have some fun trading at first and certainly get some intellectual stimulation from studying the markets, but CONSISTENCY is where the “rubber meets the road” so to speak. You will not be able to grow your trading account without consistent, steady winning trades while learning how to minimize losses and commissions (by not emotionally over trading). Day Trading the Cruel Oil (CL) and mini Nasdaq (NQ) futures with proven methods. A Daily dose of Rock and Roll! What are the key ingredients to day trading success? What are the most vital pieces of the trading puzzle to discover in order to carve out a serious career as a futures day trader? With all the risk and uncertainty out there is it really possible to make a decent living in the trading business? To start on the road to high probability trading and consistency you need to ask yourself the above questions. I will do my best in this article to answer the above questions so that you will feel comfortable exploring the high speed, high risk and potential high profit world of futures trading. Well, the truth is there really is not a “best” market necessarily because with solid knowledge of a specific futures contract you can make ANY market potentially very lucrative. Deploying very specific knowledge and then “time in front of the screen” while following that market to develop the skills necessary to trade successfully is the key! Using the very specific tools that I will show you today in this article I believe that you will be able to find consistency with steady practice and time in front of the charts. I prove what I am saying here in the live market practically every day in my “Day Traders Action Live Trading room”. 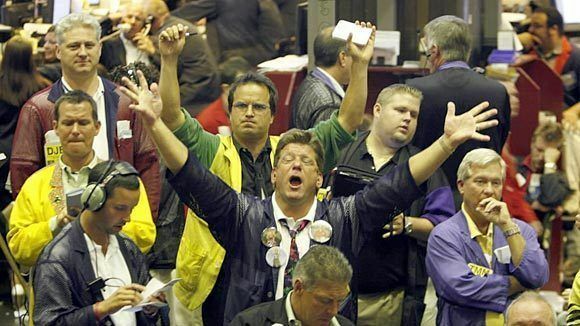 In fact, just recently we had an astounding 83 winning trading sessions in a row in our live room! I have never heard of any other trader, CTA or live trading room in my 30 years in the industry accomplish that with their specific methods. And rest assured if any trader had done that they would be announcing it and promoting that success to let other traders know that it is possible. I have indeed let traders know that it is possible to encourage them that solid trading is possible. To give futures traders encouragement, support, training, instruction, precision indicators, and indeed daily live successful trading signals has been my goal in the industry for 18 years now. I love the work I do communicating with traders every day and plan on doing this for a long time into the future. If you get a chance, stop in my trading room and take advantage of what we offer. In fact, we are the lowest cost trading room in the industry with the strongest trade results that I have ever seen in the trading room world. Please don’t get me wrong. I don’t say that to brag but to encourage traders that it is possible to use the markets to carve out a regular daily paycheck on most trading days. Futures trading is a very tough business. Always remember that futures trading is very risky and you should only be using risk capital which is defined as money you can afford to lose which by losing will not affect your lifestyle. I love telling our traders who check out our services this important risk disclosure because this futures business will draw in a lot of people who should NOT be traders. Out of the thousands of traders I have trained over the years (well over 50,000) a good portion of that group should not be trading the futures. Plain and simple many traders do not have enough money to trade futures and they do not want to develop the military like discipline it takes to become a serious futures trader. Before I get started showing you some charts along with some precision indicators I have developed, let me discuss the key ingredients to futures trading. You will need to trade with a proven, tested, highly accurate and well researched day trading system that has a long- time track record of success. You can find one of these rare gems (like my Boomerang Day Trader system) or take the harder route of “trial and error” to develop your own. If you choose this route just be prepared for many years of work, frustration and losses in trying to develop such a system. Oddly, although this second key ingredient is so important, I have found over the last three decades of trading and assisting other traders that this vital element is so often overlooked. You will need above all a crystal, clear working knowledge of how to develop and maintain a “Traders Mindset”. This means knowing and understanding fully how your brain will react to the trading business and its ups and downs during your career of this high- risk business. What I find truly astonishing in my many years of working with traders is the often blatant disregard for this most vital third element of successful trading. 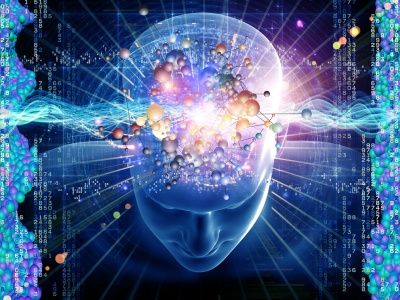 Often, I have seen that it will take a trader two or three blown out trading accounts to finally start waking up and realizing how important the Traders Mindset is in the entire process. The false assumption that a beginning or intermediate trader doesn’t need to train this aspect of their trading life can be the cause of devastating financial destruction. When confronted with these things the normal reaction of the brain is a “right of flight” response. This is what practically all new traders that I have worked with experience. The reaction in the live markets is seen by jumping out of winning trades too quickly or worst of all holding losing trades too long hoping for a reversal of the loss. Multiple this by hundreds of trades with losses and you have a formula for trading psychosis if not treated quickly and professionally could result in devastating losses. All professional athletes have personal trainers that coach them in their goals, focus and on how to improve their game. Usually this is trained in incremental, consistent improvements. Over time such incremental gains can often become substantial victories. First of all, I would like to establish a bit of credibility which in this futures industry is extremely important when deciding whose ideas or method you are going to use. This helps establish your trust in me to be able to really give you genuine, valuable training that will cut your learning curve time down some. In this business that is more valuable then gold. Below is a picture of me giving a live two- day seminar to over 320 traders who flew in from around the globe to learn my trading methods. I suggest to traders that these two books should be required reading in order to advance your career and be successful. It is well known by experienced traders that the Volume will generally lead the price movement of the market you are trading. It only stands to reason that IF you could detect a shift in volume with extreme accuracy you could potentially detect when the price is going to change in advance of the move. What we are really attempting to do in futures day trading is to “read into the future” of the price over a very short period of time. In other words, in a sense we are trying to become a “Junior Nostradamus” literally every day and indeed every moment while we are trading. IE: we are reading into the future but unlike Nostradamus we are betting money on that prediction. To accomplish this, I have developed two very specific indicators I call VOLMO (Volume Momentum) and PRIMO (Price Momentum). These are very inexpensive indicators in line with my long- time policy of NOT gouging traders for any of the services or indicators that I offer. We also have our long time (10 years on the market) highly successful proven software which is used by thousands of traders known as Boomerang Day Trader. Even though we have had thousands of traders make on going successful trades with Boomerang I have not raised the price. I have written notes on this chart showing where the Volume Momentum line shifts color (bias) and how that is followed by a reversal of price. We then see a histogram color change showing additional momentum strength in the subsequent price movement in that direction, then we can expect the price to follow. Now please take a few minutes and watch this brief video below which shows how to correlate the Volume momentum shift with the Price momentum shift on my Boomerang Day Trader chart. Note how Boomerang Day Trader gives you exact, crystal clear entries on the trades. Frankly, I am showing you the real keys to finding extremely high probability trade setups AND achieving consistency in your trading. The VOLMO and PRIMO have been my “secret weapons” for many, many years and have been developed with time, experience and literally thousands of live trades. I Just recently released PRIMO and VOLMO to the public at an extremely low cost to assist traders in speeding up their learning curve. 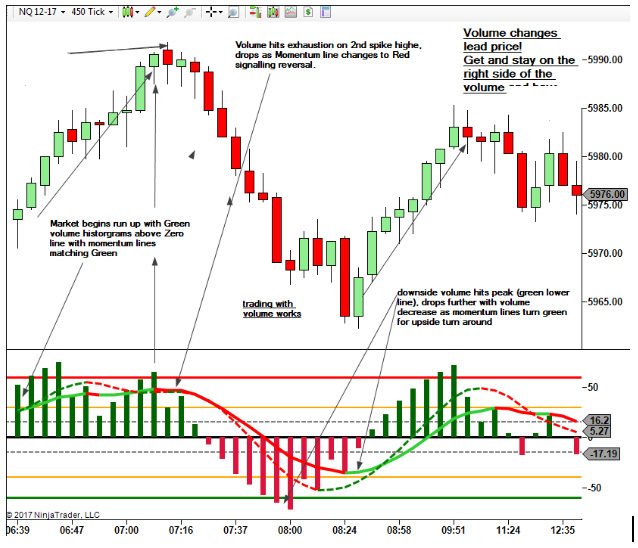 These indicators are exclusively used on NinjaTrader. Even if you decide not to purchase these indicators that I have developed, then at least point your research and focus towards Price and Volume which will speed up your journey to success in futures trading. High Probability Trades are discovered by matching the underlying bias with the surface bias. In your research you will clearly discover that to find the highest winning ratio of trades you will want to learn how to read the underlying bias of the market. I consider this to be what I call the “Helicopter view” of the markets. This can be read in several ways, but it requires an in- depth study to learn. I have prepared a special article specifically on how to read the surface and helicopter view of the market which you can study here. When you learn to read with extreme precision the surface bias of the market and you trade on that side of the market in line with the underlying bias then you are on your way to steadiness and consistency in trading. My Boomerang Day Trader software performs these functions for you along with your discretion of learning how to use the software with the exact, specific rules. These rules are easy to learn and we go over them on our regular Boomerang training webinars many of which are recorded on our blog here. In addition, Boomerang Day Trader gives you exact, crystal clear profitable entries and exits in the futures market unlike ever seen in the industry before. Boomerang Day Trader has been one of the most popular day trading software in the community for almost 10 years now delivering consistent 80-90% winning trade signals. You can learn more about Boomerang Day Trader by going to our website which, as mentioned, offers FREE bi weekly training classes which you can attend. Thank you for reading my article and I hope you will feel free to email me anytime with questions you may have on futures trading. I am dedicated to doing whatever I can to assist you in becoming a winning futures trader.